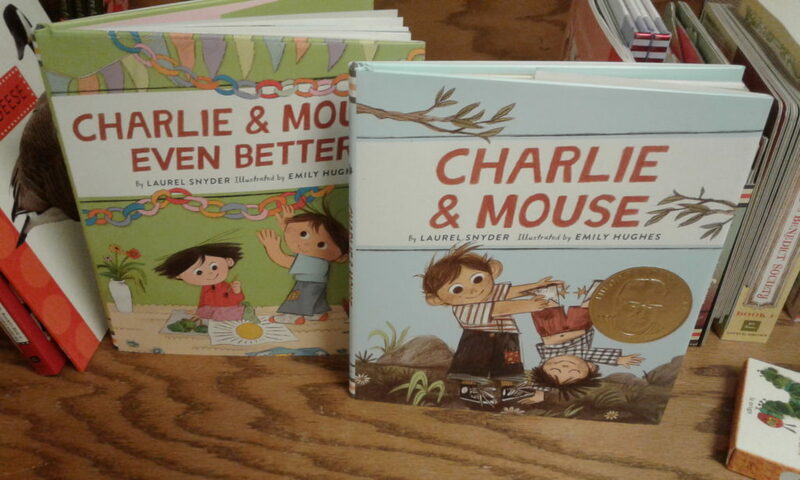 The Charlie & Mouse series by Laurel Snyder are one of those cute book series that you like but do not necessarily go “OMG BEST BOOKS EVER!” You enjoy the cute stories and the brotherly bond between Charlie and Mouse. The text is not your usual limited picture book text either. These books are more of a beginning to second grade read. This allows it to grow from a read-aloud to the child reading on their own. Also, this helps an older child who still enjoys having stories read to them to have a story that will keep their attention. These characters are rambunctious kids but not necessarily the “over the top” type. The modern tone should endear itself to modern readers. And while it is not necessarily “preachy”, it does invoke a modern way of dealing with said rambunctious characters. The text is high-energy without going “crazy.” The art of Emily Hughes is just plain fun. Their art has much detail and bright, loud, bold colors where needed, but these colors and details work well for the story. It does not overwhelm the text/story. Which is that each story has a bit of a “comedy of errors” to them. I read the books out of order and did not read book number two. However, you do not have to read them in any order. Charlie & Mouse Even Better #03 is about trying to great ready for a special event and all the silliness that can happen. Also read was Charlie & Mouse #01 where you are introduced to the family, but as said, you can read book three without having read 1. This time these kids want money and find a way to make some, but due to an obvious twist ending, they find themselves in a 180 situation and back where they started! Each of the different chapters allows for one part of the story to complete, but then moves into the next one. This way you can also stop at the end of a chapter/story as it is a longer book than usual. If you are the type who will read/not read someone due to their political standing, as a side note, Laurel Snyder has been recently trolled by Scott Baio on social media due to her anti-Trump stand. I will leave it up to you which side of that conversation you wish to be on.